I am a sucker for the Surf Pop segment of the indie scene and Triptides punches you in the face with it – albeit in a mellow manner. San Francisco bands Sonny & The Sunsets, Thee Oh Sees, and Ty Segall have accounted for some of the sweetest Garage Rock that I’ve heard in years. Throw West Palm Beach, FL band Surfer Blood in the mix and now we are grouping together my current favorite bands. 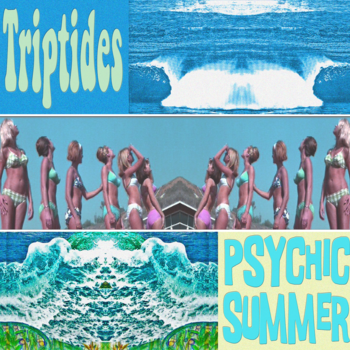 ENTER: Psychic Summer, Triptides’ first full-length LP from the indie label Beach Tapes. I was intrigued by this group after a discovery via bandcamp. Their EP Tropical Dreams was a natural extension of the sound I’ve been digging from the aforementioned Surf Pop circuit. After hearing Tropical Dreams, I could not believe that this band had escaped me. Upon research and investigation I came to the shocking discovery that this music had not originated in a state where a sunburns are as common as parking tickets. These guys were from my home state. These guys were from Bloomington, Indiana. Psychic Summer is a group of songs that defines hard work, dedication, and authenticity. Opening tracks “Going Under” and “Pier” help display their sound but also underscore their improvement since the earlier EP. Triptides has not changed their formula they have only evolved it. Songs, like “Outlaw” display their dedication to simple strong guitar riffs while pairing it with effective lyrics. The line, “There will come a time when I will go way to another town, never settle down” helps to display the nomadic message of Triptides.